Direct Rail Services 37407 hauled its first passenger train on the main line in more than 18 years on February 19, when it led the 0836 Norwich-Great Yarmouth. The ‘37/4’, built in 1965, has undergone an overhaul lasting more than two years at LORAM UK’s Derby workshops. DRS bought the Type 3 from preservation in April 2015 along with 37424. The locomotives were bought from EWS in December 2007, having been withdrawn by the freight company on March 21 2000. The last passenger train hauled by 37407 was the 1915 Rhymney-Cardiff on February 5 2000. Between June 14 2008 and April 2 2015, the locomotive was stored at the Churnet Valley Railway, and has undergone one of the most extensive rebuilds in recent times. While 37424 Avro Vulcan XH558 returned to traffic at the end of 2016, the overhaul of 37407 took much longer, in part due to issues with power units. Its first test run was on February 8 when it ran from Derby to Crewe and return with 37422. 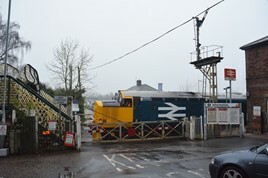 It then ran light to Norwich on February 17. For much more on this, read RAIL 848, published on March 14, and available digitally on Android and iPad from March 11.